The Goodyear Premium Rubber 2 Piece Mat set features a raised protective moisture barrier and rugged rib design for all season protection. The anti skid nib backing allows for the mat to stay in place. Includes 2 front mats. This Go On Back Seat Cover is perfect to protect your vehicle's interior from pet hair or dirty cargo. Innovative hammock style design with side walls cover the entire back seat. Made with durable vinyl and rugged straps . Fits most cars, SUVs and trucks. Quick to install. Less mess and hassle-free. Honey-Can-Do SFT-01166 Folding Trunk Organizer, Black. Keep your vehicle organized and ready-to-go with the folding trunk organizer. Dual interior compartments organize groceries, emergency equipment, sports gear, and everything in between. Velcro strips secure the organizer to carpeted surfaces to keep your belongings from spilling out and rolling around in the trunk as you drive. The durable construction is designed to hold large items with 3 mesh side pockets perfect for keeping smaller items such as maps, small tools, and accessories easily accessible. Side loop handles make for easy transport and manoeuvring . When not in use, This space-saving trunk organizer can fold flat in an instant for quick and easy storage. Enjoy seamless playback of your favourite music through your vehicle's speakers. Koolatron's 12V Digital FM Transmitter sends a wireless signal via a transmitter connected to your digital music player or smartphone, back to the 12V receiver. Enjoy your music without complicated wiring or connectors. The hands-free talk function also offers you more safety while on the road. Listen to your favourite playlist without taking your focus of the road. Premium 2 Piece Goodyear Rubber Car Mat - Black The Goodyear Premium Rubber 2 Piece Mat set features a raised protective moisture barrier and rugged rib design for all season protection. The anti skid nib backing allows for the mat to stay in place. Includes 2 front mats. 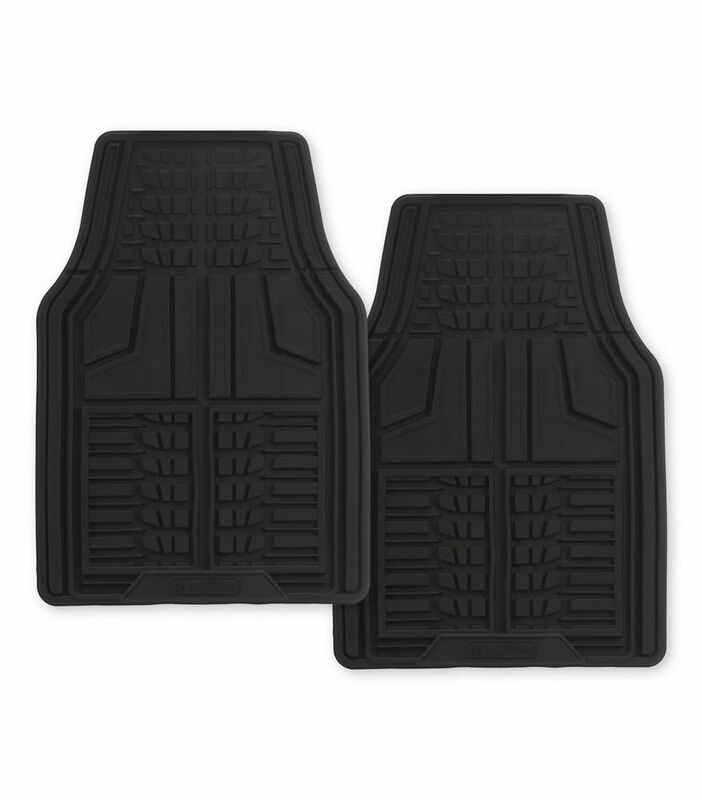 Premium 2 Piece Goodyear Rubber Car Mat - Black is rated 5.0 out of 5 by 6. Rated 5 out of 5 by ken from very good thick, durable, deep grooves for water, look good. Rated 5 out of 5 by BikerW from WOW!!! I'm 60.833 years old and these are the best mats I have ever seen in my 60.833 years of my lifetime. I bought them for our SUV and I am going back today to buy another pair for our truck. These are great if you live in snow country. One heck of a mat if you have dirty boots or shoes. Goodyear got this one right! Rated 5 out of 5 by royboy from Great Floor Mats These are great, nice and thick and haven't slid around at all. Easy to hose off when dirty and flexible enough they haven't torn or cracked. Best budget floor mats I've gotten in a long time. Rated 5 out of 5 by 1rodfan from pretty heavy duty I forgot to remove my old floor mats when I sold my last truck, and had been using carpet scraps, but with Winter coming, I began to search for some heavy- duty floor mats. I was surprised when I found them at Home Depot, and at a price below the local Napa store. Rated 5 out of 5 by Anonymous from Thick, Durable and Great Price I just purchased a new SUV and decided to install protective rubber mats. I have previously owned similar rubber mats but those mats were quite expensive. Nevertheless, I was leaning towards purchasing them again until I recently came across these mats. I love them! They are made of thick and attractive heavy-duty rubber and feature deep pockets for any water or debris. And at a fraction of the cost of the previous mats!